Jeepers. That’s plenty of snow. The good news? We finally have decent packing snow suitable for snow people and snow balls. It’s about time! 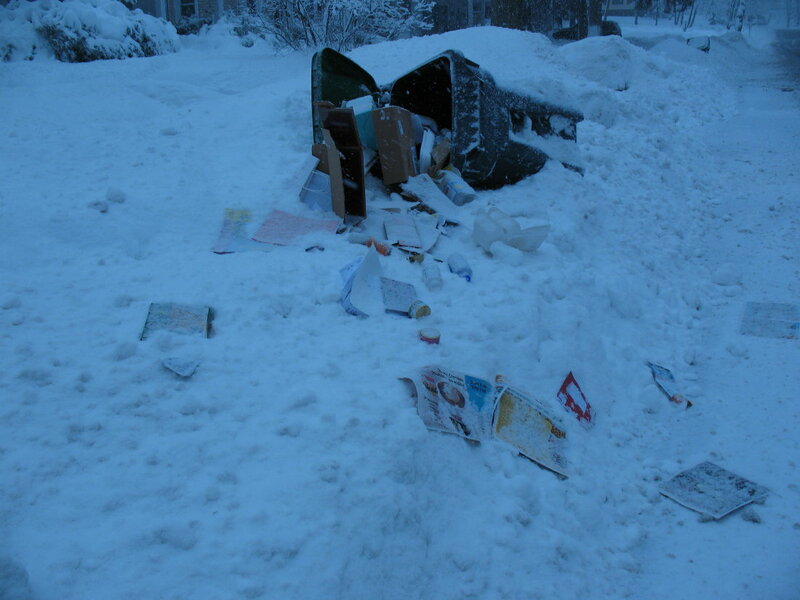 Also, remember how I said that Collins was a little iced over for sledding? Ta da! Problem solved! 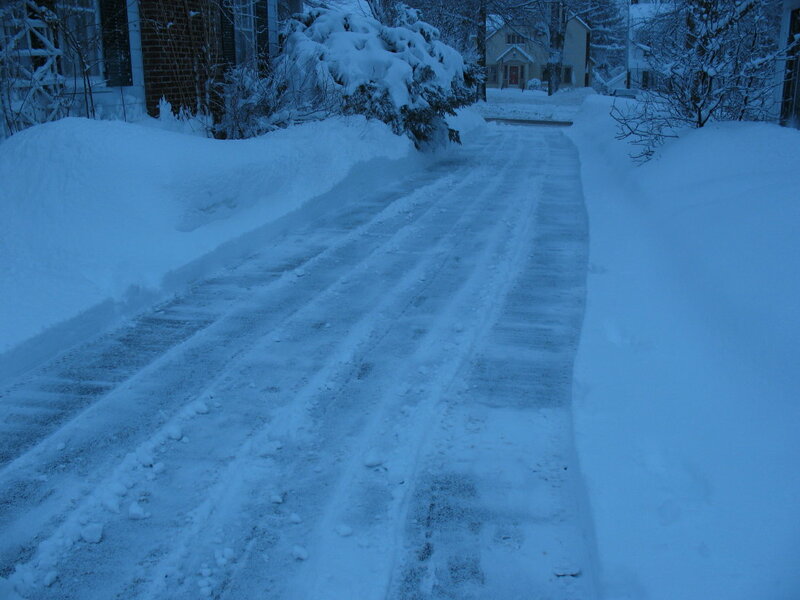 Of course, the bad news is that there’s a lot of snow clearing. 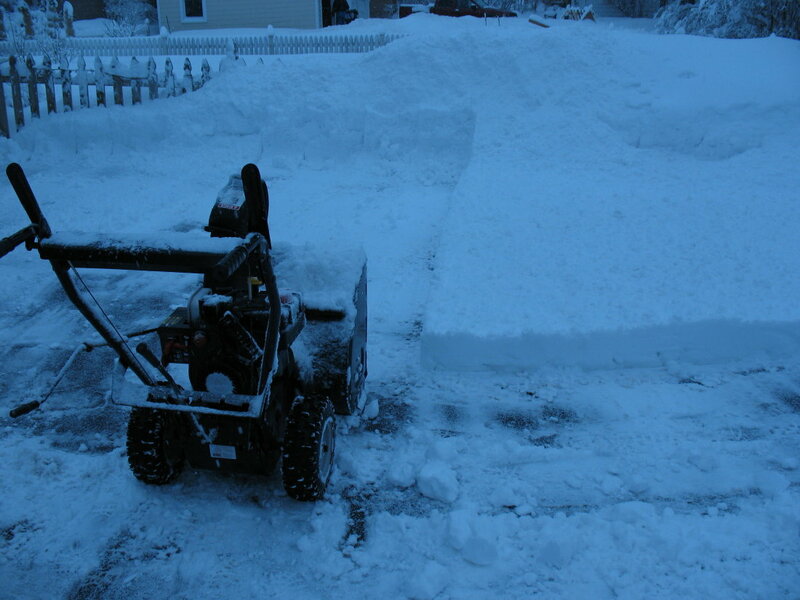 Perversely, I enjoy clearing the snow. I know it’s strange. 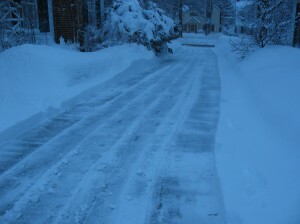 I crank up some music on the ol’ MP3 and dance and sing as I shovel and snow-blow. I’m probably singing loudly, but usually the snow blower drowns me out. At least, I hope. Generally I’m unenthusiastic about everything even vaguely mechanical, but I was enjoying myself so much today that by the end I decided that I should name the snow blower. I’m calling him Sparky. The only thing that gets old is the sheer amount of time it takes. I spent about two and a half hours outside doing driveway, sidewalk, and porch clearing, or approximately as long as it takes for a charming tot to play matchmaker between her older sister and the wealthy, kind trustee of an orphanage and for a lighthouse keeper and an irrepressible orphan to outwit a mean truant officer. That’s right: Nana Honey & Pop sent a fabulous set of Shirley Temple DVDs, so after some outside time and an extended playdate, the girls happily plopped on the sofa with Shirley while I danced outside in the driveway. The perfect antidote to the Disney Channel. Which my children don’t get, anyway, because they are deprived. 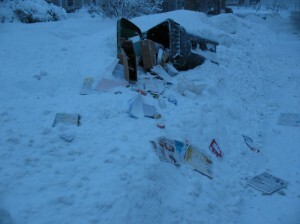 Yep, it’s recycling day, but the town snowplow must go on. Super-awesome! Lucky it wasn’t the trash. We stayed at home all day long. In fact, we’re due to go to a friend’s for dinner, and I’m supposed to bring salsa, and I called her to see if she wanted to cancel, because I had none of my ingredients for my usual salsa. And I am pretty much the biggest wimp driver ever. So I was stumped: hike with my two children to the co-op grocery which probably didn’t have tomatilloes, anyway? Get Cute W to stop even though his commute home was likely to be hellish already? Luckily I found a salsa recipe that I could concoct entirely from my pantry, since I happened to have a can of chipotles in adobo sauce and I always have Muir Glen tomatoes in the house. It’s pretty tasty, too. All in all, I was fine with the snow today. But now I’m good. Seriously, I don’t need any more.